Fall is probably my favorite season. The clothes get cozier, the colors become more vibrant and the food flavors get more exciting. 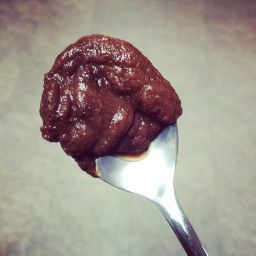 Apple butter is just one of the many things that I look forward to once fall starts, but finding a sugarless version of apple butter is basically impossible. So, if I wanted to enjoy apple butter I had to make my own. Before I made it, I also wanted to make sure I had some uses for it as well. I’ve pretty much have only eaten apple butter on toast, biscuits or off a spoon. Once I decided I had enough recipes around to justify making a large pot of the delicious stuff, I set off into coming up with the following recipe. Start by making an apple sauce. Select 7-8 large, sweet apples. Any variety of sweet apples will do- Fiji, Gala, McIntosh, Winesap. I personally used a mixture of Fiji and gala apples. Really any type of apples will do as long as you use sweet apples and avoid tart varieties like Granny Smiths or Pink ladies. Remember that since no sugar is added you have to rely on the sugars in the fruit to supply all the sweetness. Wash and peel the apples. 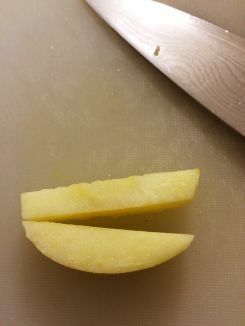 Remove the cores and chop the apples into a medium dice. 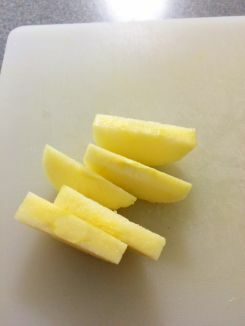 If you have one of those apple slicers you can use that to remove the core and then chop the individual segments into smaller pieces. I don’t have one so I just chopped them up the old fashioned way. 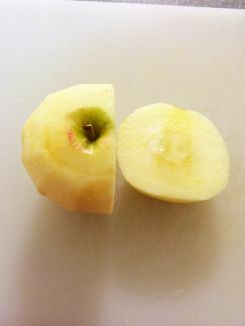 Place chopped apple into a large pot and add in about ¾ cup of water. You want about a ½ inch of water in the bottom of the pot. The apples will produce more liquid once they start to break down. Put the pot on medium-high heat. 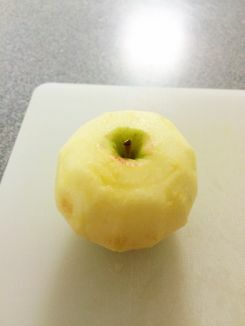 Once the water starts boiling reduce the heat to medium and simmer until the apples are soft and start to fall apart or in about 10-15 minutes. Using a slotted spoon, remove apples from the pot and transfer into a large bowl. You don’t want a lot of extra liquid in the apples when you blend them. Next blend the apples into a thick apple sauce that is free of chunks. I used my handy stick blender but if you don’t have one a blender or food processor will work fine. 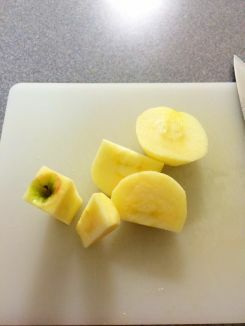 Just make sure to blend the apples in batches if you need to in order to avoid a mess. Once the mixture is smooth add in the spices and stir to mix the spices into the sauce. So now you have apple sauce. You could just set a small amount of the sauce aside to eat as is or use in another recipe. 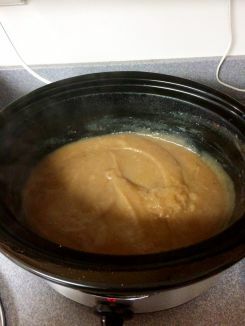 Place apple sauce into a slow cooker and set on to low heat and cover. Leave to cook for 6-10 hours checking and stirring the sauce halfway through the cooking time. As the sauce cooks down the fragrance will become stronger and the color of the sauce will change from a light brown to a rich, darker brown. The sauce will cook down to ¾ of the original volume. Blend the cooked apple butter again with one of the methods mentioned above. You want a smooth, thick texture. Taste the apple butter and make sure it is to your liking. If you think it is too thin, cook it a while longer. If you think it is too thick then try adding a little apple juice to thin it out. It is all about personal preference here. At this point you can do a few things with the finished product. You may put the apple butter into a container with an air tight and store it in the refrigerator. Or you may can the apple butter. Never canned before? Learn how! Now you have a delicious apple butter. But what do you do with it? Basically anything you want. I’ve found that this apple butter goes well with pork and hearty root vegetables. Try my pork loin recipe or the waffled sweet potatoes. Season the roast with kosher salt and pepper on all sides. In a large nonstick skillet, heat 1 Tablespoon olive oil over heat, then brown the pork for 2 minutes on each side. Place pork into the roasting dish and place into the heated oven uncovered. Mix the apple butter and cayenne pepper together and set aside. Roast the pork for 25 minutes then remove from the oven and slather it with the apple butter mixture. Return the roast to the oven and roast for approximately 20 more minutes or until a thermometer inserted into the center registers 145 degrees. Rest the pork on a cutting board for 5 minutes then slice. 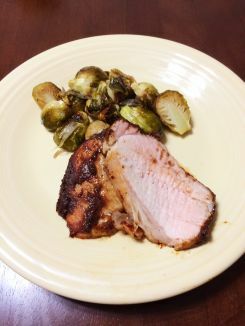 This pork roast goes really well with root vegetables as a side. I’ve done a mixture of roasted parsnips, carrots and beets. I also really like roasted Brussels sprouts. Other good options include mashed potatoes, mashed cauliflower or mashed parsnips. I have also used the meat between sweet potato “buns” and serve it as sliders with caramelized onions and sautéed kale. The possibilities are endless. Begin by heating the waffle iron to medium. Wash, peel and grate the sweet potatoes using the large holes of a box grater. 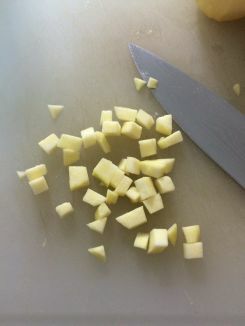 Squeeze the grated potatoes in between sheets of paper towel by the handful to get rid of any extra moisture. Brush the tops and bottom of the hot waffle iron with 1 teaspoon of coconut oil. 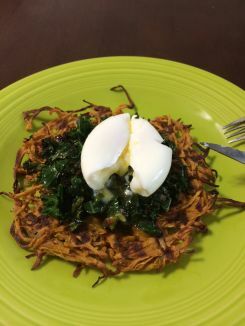 Place about ¾ cup of shredded, dry potato in the iron, spread it out, and close it. Cook until the hash browns are golden brown and crisp, about eight to ten minutes. Serving suggestions: Try it with the apple butter spread over the top. Make it more savory by topping with spicy pork, salsa and eggs. Top with various vegetables like sauteed Kale, mushrooms and onions. 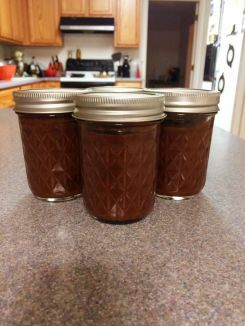 I’m sure that I will come up with a few more recipes to make with my apple butter. Comment if you have any other good ideas. 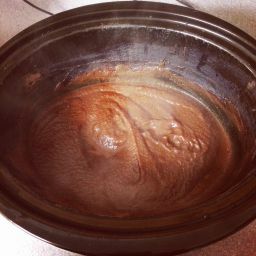 Until then I’ll be eating it these ways or straight off a spoon.